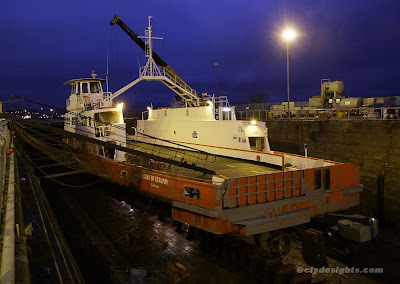 Having moved upriver from her usual waters yesterday morning, Western Ferries' SOUND OF SCALPAY is now berthed in the Garvel Drydock, where she is undergoing her annual survey. Having joined the company's fleet in 1995, SOUND OF SCALPAY is now their longest serving ferry. Originally employed on a short crossing across the North Sea Canal in Amsterdam, she was given a major refit by Garvel when she was brought to the UK, including replacement of her original diesel-electric powerplant. Outstanding image,go on post a few more! Trying to contact you but the address does not seem to work. Could you please mail me?